Paint & Sip. Create & Connect. At Vin Gogh. Join us! We are open Tuesday through Saturday. It’s easy to paint and sip! 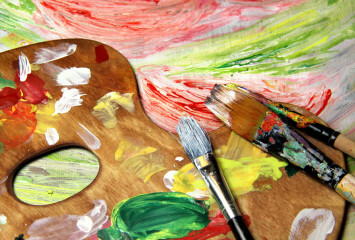 Here’s ‘how paint and sip works’! • For one price, you are provided with a canvas, easel, paint, brushes and apron PLUS a glass of wine (or beer, coffee, tea if wine is not your thing; though it is most definitely ours!). • One of our talented artists provides step-by-step direction and in just two hours, you will complete a 16” x 20” painting with your very own hands. The best part is deciding where to hang it! There is no minimum guest count required to attend. Come on your own, bring a friend or bring a group of friends. 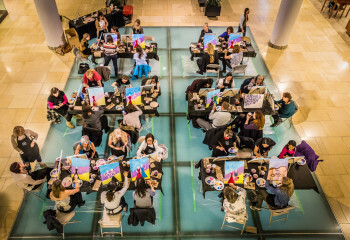 How do you register for a ‘paint and sip’ session? • Go to our Calendar. • Choose a project you like. Click on it to register for that session. This is a social event; not a class.